L’Artisan Parfumeur has launched Natura Fabularis, a new collection of six fragrances intended to evoke a 'dreamlike' imaginary garden. 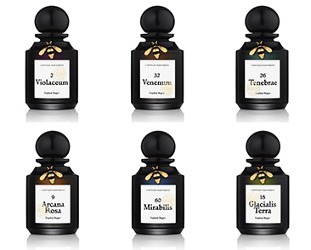 The series was developed by perfumer Daphné Bugey, and each scent has a number that represents the number of trials before the final formula. Violaceum 2 ~ the 'transience of nature', with violet, carrot and saffron. Arcana Rosa 9 ~ an 'insolent' spicy rose with vetiver, juniper, labdanum, cedar and sandalwood. Glacialis Terra 18 ~ a 'frosted' garden with absinthe, ice cubes and vetiver. Tenebrae 26 ~ a 'dense and dark forest' with incense, resins and sap. Venenum 32 ~ a 'field of grains', with sandalwood, masala chai and cereal grains. Mirablis 60 ~ 'science vs. nature', with incense, ambrox and musk vulcanolide. The L’Artisan Parfumeur Natura Fabularis collection is available in 75 Eau de Parfum, €160 each. These look interesting. Love the bottles! Super cute. And the Latin names are great. The bottles are quite nicely done. The numbers are even sillier in this context — now who wants #2, which she just whipped up on her lunch break? And really who wants to say that they were just sprayed with number 2? Exactly, I agree with you both. For some reason, I can’t even get myself into #60, either – it makes me think it better be a masterpiece or it wasn’t worth all those tweaks. You read my mind. It was completely perfect on the second try? Even Mozart crossed out a note every now and then. I think there’s something marvelous in something so simply and easily beautiful. :::faints::: Are samples of these available anywhere, that you know of?